Whatever happened to Russia’s economic miracle? The first eight years of the last decade were incredibly successful for Russia’s economy, but the crisis of 2008 hit hard and growth remains decidedly sluggish. Dmitry Travin wonders whether the country’s economy will ever be able to regain the Midas touch. Does Russia have a strong or a weak economy? It’s very difficult to judge by just looking at its Gross Domestic Product (GDP). In the 1990s the GDP fell steadily, creating an impression that the Russian economy was in meltdown. But after reaching its lowest point in 1998, it began to grow again, showing an annual rise of up to 7-8%, considerably higher than the equivalent figures in developed countries. People began to talk about Russia, under its new leader Vladimir Putin, undergoing radical change and gradually emerging as a front runner in economic development. In the first years of the new century it was talked about in the same breath as other large rapidly developing states such as China, India and Brazil. Some optimists even expected an ‘economic miracle’ that would put Russia in the forefront of global economic development. Then suddenly it all changed. The economic crisis of 2008 hit Russia especially hard. By autumn the GDP was starting to fall, and the overall figure for the year reached barely 5%. The following year was catastrophic: instead of rising by 8% GDP fell by the same amount, confounding many of the experts who analysed the situation. The Russian government, however, tried to gloss over this apparently disastrous state of affairs, blaming the West for the crisis and claiming that everything was fine: the economy was healthy and it was just a question of overcoming the negative effect of problems originating in the USA. 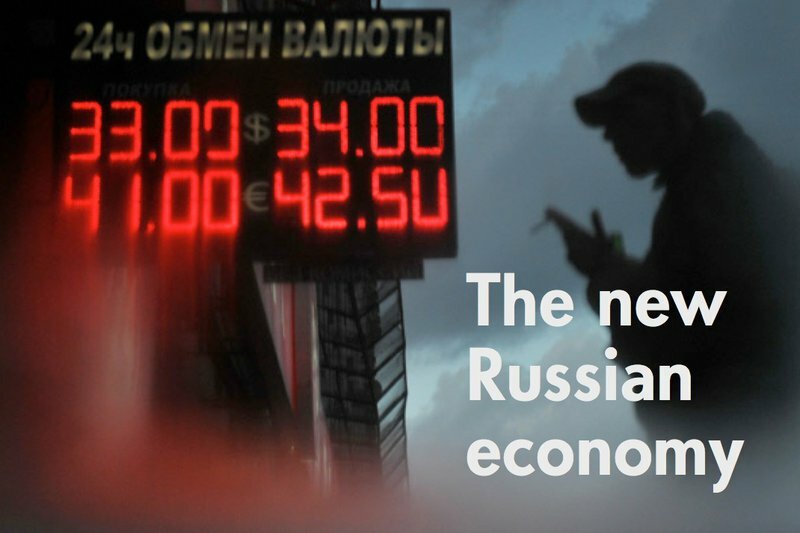 Three years have passed since the 2009 crisis – long enough to allow an accurate assessment of the real state of the Russian economy. We can say that it has recovered from the catastrophe of 2009, but that it has failed to return to the astounding rate of growth that marked the mid 2000s. At present the increase in GDP is about 4% per annum, half the rate of its best performance, and there is a growing pessimism among Russians about possibilities for further growth, let alone a return to the figures of several years ago. Why all the boom and bust? So what caused these extreme swings in GDP, from collapse in the 90s to rapid growth, then the crisis of 2008-9 and the slow increase of the last three years? To answer that question, it is essential to understand the enormous changes that have taken place in the Russian economy over the last two decades. The collapse of the 1990s was a result of a radical change in the structure of Russia’s economy: many areas of production developed in the Soviet period could not remain unchanged in the switch to a market economy. The defence industry, for example, shrank heavily, since Russia’s reformers wanted to leave behind the Cold War and the arms race, and the government was no longer interested in financing the production of tanks, warships and artillery. So those factories that couldn’t rapidly convert their production from military to civilian and consumer hardware basically had to close down, and this was of course reflected in the GDP. The events of the 90s were a hard test for Russia, but not in any sense a catastrophe: the widespread closure of industrial plants was a necessary step towards a complete break with the Stalinist model of a strongly militarised economy. The rapid growth of GDP between 1999 and 2007 was a sign of serious renewal in the Russian economy. This had, however, very little to do with Vladimir Putin, who came to power in 2000. Putin influenced growth only through a reform of the tax system (initiated by his Finance Minister Aleksey Kudrin), which lowered the rates of almost all principal taxes. This reform was a very sensible measure, but the main reasons for rapid growth lay elsewhere. In the first place, at the end of the 90s a decline in the rouble exchange rate brought about a steep fall in foreign imports. The empty shop shelves began to be filled with locally-produced goods. In the second, a steep rise in oil prices brought soaring profits for Russian energy companies: oil and gas are Russian industry’s key products and a favourable situation on world markets had brought benefits for the development of the country as a whole. Given Russia’s strong dependence on oil and gas exports, it was no surprise that the 2008 crisis affected GDP. Global prices fell: so much for the Russian ‘economic miracle’. Since then, oil prices have risen again, but not to the level they reached in the summer of 2008. So the state of the Russian economy today can’t be compared to that of the years before the crisis; the improvement in prices has been enough to compensate for the drop experienced in 2008, but not sufficient to create a stimulus for further dynamic growth. Russia’s economy lacks any alternative to oil as a driving force to carry other branches of industry along with it. For that reason, if oil prices remain at their current level, the rate of rise in GDP will probably drop or even stagnate. Can we talk about another factor that could replace oil prices as an economic stimulus in Russia? If global demand for oil and gas remains steady, Russia has enough reserves to avoid economic crisis for another couple of decades. Putin is well aware of this, and has encouraged the construction of oil and gas pipe lines capable of supplying enough of these fuels to meet higher future demand from international customers. These include the ‘Northern Stream’ (which can probably be considered a real success) and ‘Southern Stream’ gas pipelines to Europe, and the ESPO (Eastern Siberia-Pacific Ocean) oil pipeline. The Russian government has, however, failed to take into consideration the rapid development of shale gas production in the USA, which is creating a global market situation that is less favourable to Russia. 2012 saw, for example, a shutdown in production at the Shtokman gas condensate field in the Barents Sea, a project that Russia had great hopes for until very recently. And although Putin says that he will find investors for the Shtokman field in the near future, there can be no guarantee that this will happen. It may turn out that in the light of the changed situation in the gas market, its development is already unviable. The future of oil sales to China may also be shaky. The problem is that the ESPO pipe line takes oil to the northern regions of China, which are among the least developed parts of the country. Other areas, with a greater demand for oil, are just as easily supplied from further afield using tankers, so Russia will encounter stiff competition from other producers there. Can Russia go on living off its oil and gas? Russian economists have long since been talking about the need for Russia to abandon its dependence on oil and gas and develop other economic sectors. The current depressed investment climate, however, makes this difficult. For Russia to begin to live off a highly efficient industrial sector, rather than oil and gas revenues, it requires serious foreign investment. But as the last few years have shown, no one is investing in Russia. The country, moreover, has only itself to blame for this, since it has failed to provide any guarantee of ownership rights. This issue is covered in more detail in Pavel Usanov’s article about the investment climate and Andrey Zaostrovtsev’s about the so-called ‘Oprichnik Economy’, named after Ivan the Terrible’s bodyguards who, answerable only to him, felt free to lay whole regions of Russia to waste. To keep up the growth in GDP, Putin will probably resort to more state regulation in the near future. This will, for instance, include an increase in the defence budget, in the hope of stimulating production in the military industrial sector. This approach will also strengthen his political position, since this sector’s employees have been his core support group during the wave of protests that has shaken Russia over the last year. People in the defence industry realise that any development of democracy in Russia will mean cuts in military expenditure, and they are determined to keep Putin in power if they can. The Russian government, however, simply doesn’t have the money to increase defence spending to any extent. Conflict over this issue already led, a year ago, to the resignation of Finance Minister Aleksey Kudrin, who argued that today’s Russia couldn’t afford a more military-based economy. Putin accepted Kudrin’s resignation, but still listens to him and won’t let his government allocate more than a reasonable amount to defence spending. One has to conclude that unless oil prices go up, Russia can probably expect a lower rate of growth in GDP. A new economic miracle is just not on the cards.